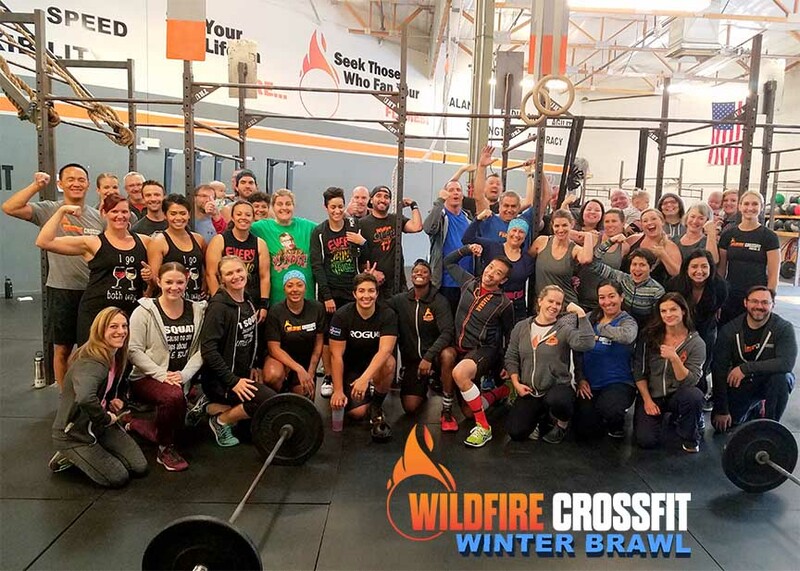 The Winter Brawl was this weekend at WildFire CrossFit. Coaches Erin, Bri, Laura, & Kiara did s great job programming workouts that were challenging for all levels, and a lot of fun. 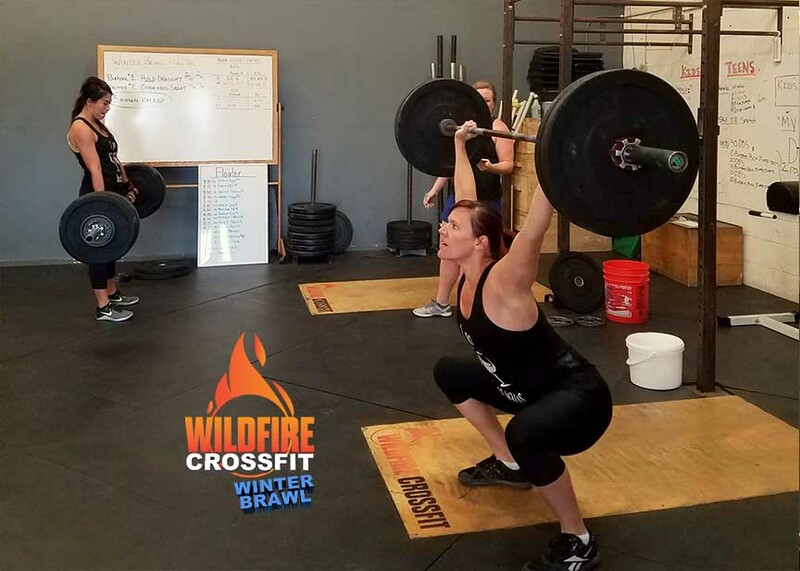 Teams of 2 males or two females in Rx and Scaled Divisions competed in 3 different workouts. For the first workout, one partner ran 400 meters while the other rowed for calories. They kept switching between run and row for 10 minutes, accumulating calories, and making this an outstanding test of endurance. The Score was the total number of Calories Rowed in 10 minutes. The weather was a perfect, with overcast skies and crisp, fall air, allowing the athletes to go fast enough to give them that nice “Fran Cough” feeling for the next hour. Having your lungs burn while you are holding up an axel bar was the next challenge in the Floater workout. 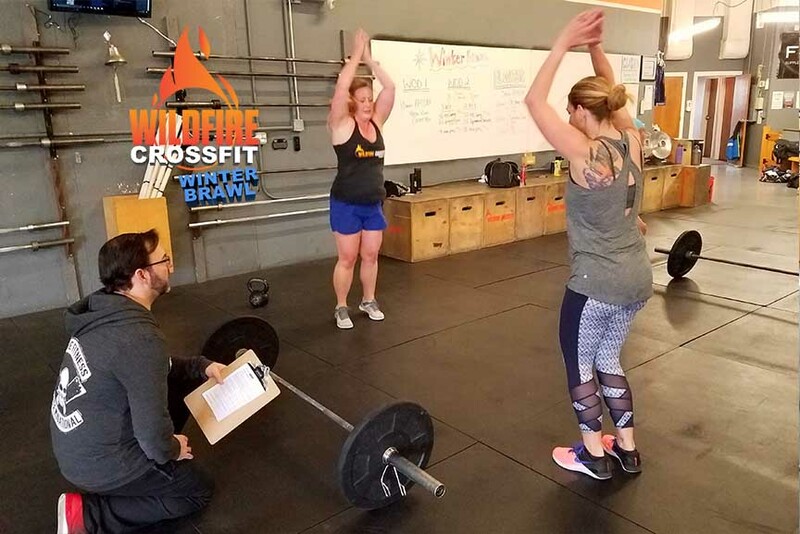 In this workout, athletes had to complete as many Overhead Squats as possible while the other held up an axel bar at the top of the Deadlift, or Hang Position. Overhead Squats could only be performed while the axel bar was off the ground. This was a nice little tax on the grip heading into the final workout which started with 50 Kettlebell Swings. Partners took turns chipping away at the reps. Once they were completed they moved on to 25 synchronized burpees. Competitor, Greg Giovannoli said “the plan goes out the window when Burpees are in the workout”. Athletes had to touch the ground at the same time and then jump over the bar with two feet. Then, they went to work on 50 Push Press, again working back and forth until they were completed. And that was just the first round. Rx Athletes had to complete 3 rounds and Scaled Athletes 2, with a 15 minutes time cap. This was the workout where Team Work really came into play. Maximizing the strengths of each athlete to work efficiently through the workout. Some chose to split the work fairly evenly, others did more of the exercise they were stronger in. Every team kept working the entire time and pushed to the very end, and the crowd that came out to support them made it a lot of fun and gave them the energy they needed to go for it in every workout! For many athletes, it was their first taste of competition. For others, it was a good challenge to prepare for upcoming comps such as the CrossFit Games Open. We are extremely proud of every athlete who participated. I know I had a blast helping to judge and cheering athletes on all morning. It was awesome to see many of our Veteran athletes step up and lead by example. It was awesome to see so many of you who have been working so hard, crush it on Saturday! Thanks to the Coaches for planning, organizing, and executing a GREAT event! Everyone had a great time! Thanks to the everyone who came out to support these athletes! This is what Community is all about! Today we are going to be doing a Hero WOD. Hero workouts are named after fallen members of the military and public service officials. This, like most of the Hero workouts, is one where you just need to keep moving the whole time. When you come in from each run, be ready to attack the next exercise. Because there’s only 20 reps of each exercise, you can challenge yourself with the weight and range of motion. Whatever weight you choose you should be able to do sets of 5 during the workout. Have fun today and honor those who sacrificed everything to protect our freedom and remember how fortunate we really are this Holiday Season. OHS: Use DB or KB for Goblet Squats. Focus is torso upright during the whole squat.